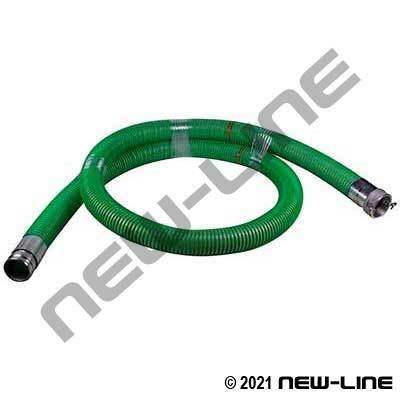 NL3310 Tigerflex TDH & NL3315 are uniquely designed gasoline drop hoses designed to handle gasoline/fuel blends with MTBE's, methanol, ethanol (up to E98), toluene, naphthas, kerosene, benzene, biodiesel (up to B100) and MEK without degradation (aromatic content not to exceed 50%). They have a translucent wall to permit visible confirmation of flow (also available in non-translucent black wall Tigerflex TDHBK). Their urethane construction creates a lightweight, flexible, and easily handled hose, even at temperature as low as -40°C (-40°F). This hose is also resistant to flex-fatigue and cracking (which is commonly seen in the transitional area of rubber hoses). The N3311 (left hand) & N3301 (right hand) spring sleeves are used for ease of installing "banded clamps" and to relieve bending stress at the fitting. New for 2015: NL3315 is a generic unbranded product that delivers quality and economy, it offers a lower price point alternative to higher end, proven brand name products and is designed to compete with lower cost alternatives being introduced to the market. NOTE: These hoses are designed for drop hose applications only and are not designed to have fuel permanently left in the hose, it must be drained after each use. For ordering popular assemblies refer to A3310 part numbers. Detail Comments: Tigerflex TDH is designed for drop hose applications only and is not designed to have fuel permanently left in the hose, it must be drained after each use. For ordering popular assemblies refer to A3310 part numbers.